OK, LSx friends! You are probably dreading going through that old wiring harness and pulling out the various pins and wires and making everything work together yourself.....or worse yet, sending your harness to "Jake" that works at your local insurance company, and does this kind of thing on the side! Well, look no further! We have exactly what you need to get on the road....no more surprises from what you attempted to do, no more lost time pulling pins from the Blue ECM or Green ECM and having to tie them all together or removing a ton of wires (which is what is required). All that being said, this is the quickest and easiest way to be running and on the road with your LS project. This will work with your crate motor, your junkyard motor, or the transplant from a running candidate in your stable. The harness is ready to go! All of the unnecessary wires are removed! Only wires essential to your LSx swap running the way it was meant to be. They’re made with XLP heat and fire resistant wire and new OEM connectors. They include the OBDII diagnostic/tuning port and a weatherproof fuse relay panel with diagram. The woven nylon covering is much better looking, easier to route, and will not wear on other components like factory convoluted tubing. 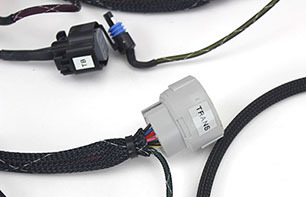 Optional with the kit is an OE engine control module that has been re-flashed to remove all of the unnecessary elements like vehicle anti-theft system (VATS) and secondary o2 sensors. Or you can send in your ECM for the VATS to be removed and get you the basic running system for completion. It is then tuned for a stock to mild camshaft with shift points to work for most builds. If you are running a strange combo or a large camshaft email us for a different pre-program or your final tune can be made on a local tuners dyno. Everything is tested on a running engine before it leaves the factory. Just plug it in and start enjoying your new LS swap! NOTHING COULD BE EASIER! Not sure if your motor is 24x or 58x? Well, here is a sure way to know: all 24x reluctor wheels are detected by a black sensor, while 58x use a grey sensor. This sensor is located at the back of the block, near the oil pan, on the passenger side of the engine, just above the starter. Order yours today! There are only a few short questions that you need to answer, and we will get you going! No time to stop now! Let's get you going today!